If you suspect your home was been painted with lead-based primer or paint, and especially if you have children or pets, you should have the paint (and possibly your soil and water) tested for lead paint contamination. An alternative to hiring a certified risk assessor or inspector is collecting paint samples yourself and sending them to an NLLAP accredited lab for analysis. NLLAP stands for National Lead Laboratory Accreditation Program. Results can take anywhere from 72 hours to several weeks. If you need instant results, purchasing a consumer lead test kit might be the best option. Kits are available for testing paint, water and soil. Make sure you select the right one. Understand that accuracy depends on how well you follow the package instructions. So be precise. One reliable product that is good for homeowners and contractors is the Homax lead-test kit. The kit is available in several sizes, depending on the number of samples needed. 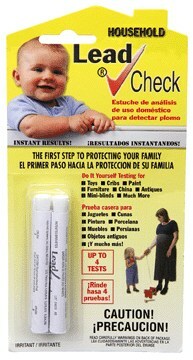 In fact, many parents keep such a kit in the house for testing paint on imported toys. The is also valuable to contractors who are not likely to pay or wait for professional lead testing every time they work on a building built before 1978. It provides them with an inexpensive and fast way to know if cutting and scraping would contaminate the building and expose their workers to hazardous lead. Contractors dealing with a possible lead paint situation often take advantage of the larger kits. These DIY kits are faster and more economical than paying for testing on every job. They allow any contractor to know what they are getting into before the first cut or scrape. These tests help contractors limit their liability. 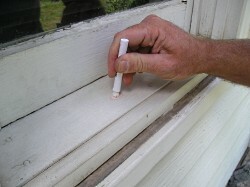 For example, when lead paint flakes it often contaminates the ground. By testing the soil first, before touching any paint, contractors can avoid blame for ground contamination. Anywhere you see built-up and peeling paint could be hiding places for lead based paint underneath, so be thorough with the testing. Don’t forget door jambs and windows, stairs, handrails, and columns. If your home is older but was recently remodeled, you will want to make sure there are no lead particles in the air, especially if any plaster was removed. These particles can compromise air quality for 6 months or longer.